The broad architectural style category we refer to as Spanish Colonial Revival occurred from 1890-1940, and reached it’s peak during the years 1924-1932. This style is very common in US states with Mediterranean -like climates with California and Florida as strong examples. It grew from a number of sources, and according to David Gebhard, noted architectural historian there were two distinct phases. The first phase known as Mission Revival covers the period from 1890-1920. The second phase was from 1920-1940 and was known as the Mediterranean Revival. If we look at the first or Mission phase, in the late 19th century there was a desire to go back to our roots, whether real or imagined. One factor was the decline of the Spanish Missions here in California and a desire to refurbish and preserve them. Another was the publication of Helen Hunt Jackson’s Ramona in 1884. Jackson was a friend of Harriet Beecher Stowe, and hoped that her book would draw attention to the mistreatment of Native Americans in much the same way that Stowe’s Uncle Tom’s Cabin drew attention to the mistreatment of Negros. The unintended result, however was that the book’s storyline raised a desire for romance and fantasy. While the Mission Revival began to fade, as predicted by architect Bertram Goodhue, the desire for romance and exotic far away places continued. Two drivers of the Mediterranean Revival phase were Washington Irving’s book titled The Tales of the Alhambra, and the 1915 Panama-California International Exposition in San Diego. In addition to the ideas and inspiration from these two sources, the Ecole des Beaux Arts and World War I conspired to create another source. The Ecole encouraged architectural students to take the “grand tour” of the architectural highlights of Europe. Due to the war, many found Spain a safe, accessible alternative to other European destinations. Although not a student of the Ecole, it happens that George Washington Smith, the premier Spanish Colonial Revival architect in the Santa Barbara area visited Spain at this time. In 1918, Smith designed and built his own home in Montecito, and his career as an architect was launched as a result. The Casa del Herrero or house of the blacksmith was a home originally built for George Fox Steedman in 1925 in Montecito, CA and is now open to the public. The city of Santa Barbara and surrounding areas were a hot spot for this style of architecture for a number of reasons. One was a desire to re-establish the Spanish style of architecture, much of which had been lost over time. Second was the need to rebuild following the 1925 earthquake. Many architectural characteristics of the Spanish Colonial Revival style can be traced directly back to Spain and the Andalusian region, as well as the Alhambra. Examples include design elements such as arches, fountains, courtyards, red clay tile roofs, and Arabesque ironwork. These elements can be traced directly to Spain’s architectural history and the significant Moorish / Islamic influences there. Romantic elements such as widow’s walks are also common, while elaborate Churrigueresque decorative details are sometimes found in non-residential buildings. 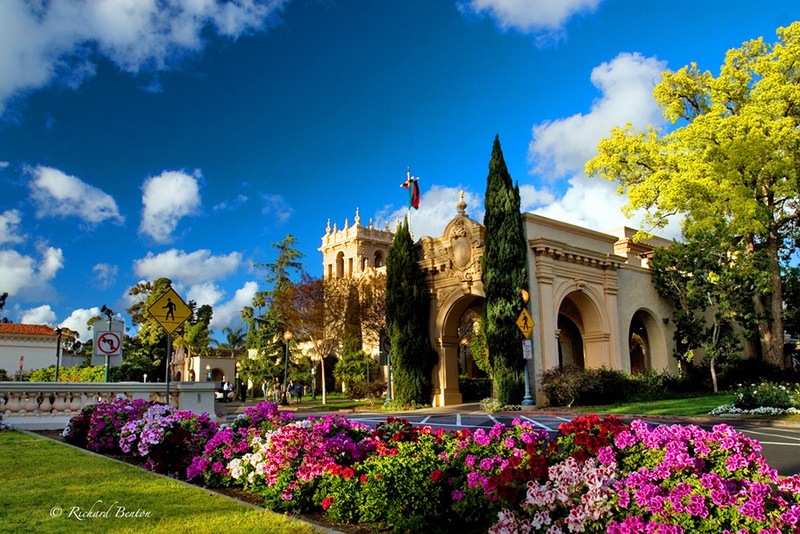 Here are a few examples — first is the building designed by Carleton M. Winslow under the direction of architect Bertram Goodhue for the Panama-California exhibition in 1915, which is part of San Diego’s Balboa Park and a National Historic Landmark. Another ornate example is shown below and features Churrigueresque elements. The building in this case is Beverly Hills City Hall, designed by William J. Gage and Harry G. Koerner. The building was originally built in 1932 which was during the peak period for this architectural style. A classic residential example is the Adamson House in Malibu (see below) which has also been designated as a historic site. The home is open for tours, so if you are in the area check their website for hours of operation. They also are available for weddings, and the setting would be especially memorable. Note the arches, the widow’s walk, chimney style and use of tile as these are all common elements of the style. While the house was built 86 years ago, the architectural style has maintained it’s allure — the prime Malibu beach location doesn’t hurt either. Our next installments will feature some of the key architects who popularized the style and will explore how to create interiors which complement it. If you are visiting the Southern California region I’ve intentionally included a number of sites which are open to the public for your viewing pleasure. Let me know your thoughts on any that you visit. I hope you’ve enjoyed reading this post! Your feedback on what else you’d like to learn about in the world of architecture and design is appreciated. By the way, ICYMI, I have a series on Hollywood Regency design which is another style with deep roots here in Southern California. This entry was posted in Everything, Interior Design and tagged adamson house, balboa park, bertram goodhue, beverly hills city hall, casa del herrero, david gebhard, Featured, george Washington smith, house of hospitality, spanish architecture, Spanish colonial revival, william gage. Bookmark the permalink. Thanks for reading, it is one of my favorite architectural styles !